Dynaflex Pro is a revolutionary gyro exerciser! It powers up with the rising pitch of an F-18 fighter - with no batteries, no motor. Yet we dare you to hold on to it!. Give it a quick pull or thumb flick to get it moving. Rotate your hand. It starts to race and hum. Soon its whirling at over 9,000 revolutions per minute! Meanwhile, your wrists, grip, and arm are straining and working out against a powerhouse gyroscopic action. 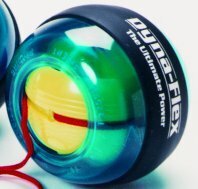 In fact, Dynaflex PowerBall is now spinning internnaly so fast that it wants to leap out of your hand! Need a break? Pass it on to an unsuspecting friend. Watch them try to hold onto it! As an executive relaxer, a carpal-tunnel/arthritis reliever, or a strength and coordination builder, Dynaflex will knock your socks off! Dynaflex Pro line is designed with a high performance rotor, which can reach speeds of up to 13,000, rpms and puts out 35lbs. of torque. The product line also features a new thermo band which aids the user in controlling this powerhouse. The Pro line was designed not only to be user friendly but to aid in sports rehabilitation and conditioning. Copyright © 2019 5 Star Shoppingnets All rights reserved.